The 100 air-mile exemption, which is in the regulations at §395.1(e)(1), allows a driver to use a time record in place of a log, provided that certain conditions are met. While this is possibly the most widely used hours-of-service exemption, it may be the most commonly misused exemption, as well. Include the starting and ending times for the day and the total hours on duty on the time record for the day. The company must retain the time record and have it available for inspection for six months. What if the driver goes too far or works too many hours? If the driver cannot meet the terms of the exemption (he or she goes too far or works too many hours), the driver must complete a regular driver’s log for the day as soon as the exemption no longer applies. If the driver has had to complete a log 8 or fewer days out of the last 30 days, the driver can use a paper log for the day. If the driver had to complete a log more than 8 days out of the last 30 days, the driver needs to use an electronic log for the day (unless one of the ELD exemptions applies, such as operating a vehicle older than model year 2000). When a property-carrying driver is operating under the 100 air-mile exemption, the driver is also exempt from having to take the required 30-minute break (see §395.3(a)(3)(ii)). If the driver began the day as a 100 air-mile driver and is more than 8 hours into the workday without a break, and something unexpected happens and the driver can no longer use the 100 air-mile exemption, the driver must stop and immediately take the 30-minute break as well as start logging. If the driver went outside of the 100 air-mile area before the driver had 8 hours in, the driver would be expected to take the break at the appropriate time. To be able to use this exemption, drivers operating ready-mix concrete vehicles and drivers transporting asphalt must return to the work reporting location for the day within 14 hours, rather than 12 hours. Also, a driver that qualifies as a “driver-salesperson” does not have to return to the work reporting location. The driver must have the time records in the vehicle. Myth. The driver simply needs to explain to an officer during a roadside inspection that he/she does not have logs due to operating under the 100 air-mile exemption and that the required time records are back at the carrier’s office (just telling the officer, “I don’t have any logs” will lead to a violation, so the driver needs to know to provide the full explanation). The driver must log the previous seven days if he/she had been using this exemption and suddenly can’t. Myth. If the driver cannot use the exemption on one particular day, that is the only day the driver must use a regular log (either paper or electronic). Passenger-carrying drivers and drivers hauling hazardous materials cannot use this exemption. Myth. There are no restrictions on the use of this exemption, so any commercial driver can use it. A driver that crosses state lines cannot use this exemption. Myth. As this exemption appears in the Federal Motor Carrier Administration (FMCSA) regulations, it can be used by interstate drivers. 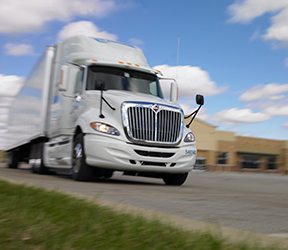 Only drivers that operate out of a “company terminal” can use the 100 air-mile exemption. Myth. As long as the driver makes it back to the work reporting location for the day within the appropriate number of hours, the driver can use the exemption. Drivers that move from one jobsite to another every few weeks cannot use this exemption. Myth. If a driver that normally uses this exemption switches work reporting locations, the day the driver switches work reporting locations is the only day the driver cannot use the exemption. Drivers covered by this exemption are also exempt from the driver qualification (licensing and medical cards), driving, and vehicle inspection requirements. Myth. The only rules the driver is exempt from are the logging requirement in §395.8 and the 30-minute break requirement in §395.3. The driver cannot drive more than 100 miles for the day. Myth. The driver can drive as many miles as he/she wants to or needs to, as long as the driver stays within the 100 air-mile radius circle and gets back to the work reporting location within the appropriate number of hours. If a 100 air-mile driver gets into a vehicle with an ELD, the driver must use it. Myth. The carrier can have the driver log in and have the driver entered into the system as an “exempt driver,” or the carrier can request that the driver not log into the device and then attach a comment to the unassigned driving time generated by the driver’s movements. The comment would need to explain that the driver using the vehicle was a 100 air-mile driver who submitted a time record. It is up to the carrier to decide which option to use. If stopped for a roadside inspection, the driver will need to be able to explain to the inspector that he/she is an exempt driver using the 100 air-mile exemption, so using the electronic log is not required. Stay within the 150 air-miles of their work reporting location. If the driver stays within the 150 air-mile radius of the work reporting location, and returns to the work reporting location within 14 hours on 5 of the last 7 days, and 16 hours on 2 of the last seven days, the driver is allowed to use a time record in place of a log. If the driver does not meet the terms of the exception, the driver will need to complete a log for the day. If the driver had to log more than 8 days out of the last 30 days, the driver will need to use an electronic log for the day. All of the other issues discussed above would apply to these drivers as well. If you have drivers that use these exemptions, you will need to check time records to make sure they are complying with the appropriate time limits. You will also need to check movement records to verify that the drivers using these exemptions are staying within the mandated area (within 100 or 150 air-miles). If a driver is over the hours limit, or has gone too far, you need to verify that the driver took the required 30-minute break and submitted a log for the day, either paper of electronic, depending on how many days the driver had to log out of the previous 30 days. During an audit, if it is discovered that your drivers are using these exemptions incorrectly, you will be cited for not having drivers’ logs when required and for violations of the 30-minute break requirement. Each day this occurred will be another violation, so the fine could be rather large if you are not managing the use of these exemptions! My AOBRD broke down. Now what? View 100 air-mile exemption regulations and interpretations in the FMCSA Compliance Manual, an authoritative safety compliance manual to help companies operating commercial motor vehicles (CMVs) comply with FMCSA regulations. Click here to trial this manual for free or view our full library of transportation compliance publications.